of From Now On - The Educational Technology Journal. No more hunts for simple facts - deadly, tiresome and lacking in value, mind-numbing activities without import. This article offers something like a cider press - but one that easily produces intriguing questions from the mass of curriculum content that usually inspires mere collection or varieties of trivial pursuit. Try the Question Press on standard content and watch your students squeeze meaning out of inert matter. Give them a lift. Engage them in making up their own minds. Equip them to manage the tough questions of life. © 2004, Jamie McKenzie, all rights reserved. Like essential questions, questions of import are worthy of our time but are also likely to spark interest and awaken curiosity. They require thought rather than mere collection of facts or simple cut-and-paste thinking. In previous articles, FNO has stressed the importance of students learning how to wield different types of questions to figure out complex issues and problems. Questions work together as a system. As we begin to orchestrate various question types in the pursuit of understanding, we expand our capacity to think and act in smart ways. We gain in our ability to collect and fashion intelligence rooted in reality rather than presumption or wishful thinking. We are protected somewhat from bias, ideology and narrow thinking. We learn to seek truth wherever it (or they) may be. Unlike these boys on an Australian beach digging to China, we do not always dig straight down. We do not fall into the trap of silo thinking. After sustained practice with challenging questions, students become skillful at juggling combinations of questions to make sense of their world. 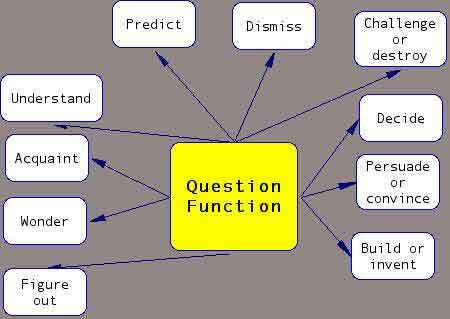 Use the chart below to fashion demanding questions from your curriculum content. Pick a function, read the sample questions and then start writing your own. Effective teachers will shift question types throughout the year so that students must wrestle with all of them. In popular terms, the goal of this questioning activity is to "get one's head around" some topic, idea, challenge or proposal. By the end, one hopes to grasp key traits, elements and structures. 1. Go find out about Robert or Elizabeth Browning (or any other poet, general, prime minister, hero, character, celebrity, scoundrel or seer. What did he or she do? What were the 5 most distinguishing characteristics of Browning and how did they contribute to her success of failure? What made her great or not so great? What are the 2-3 most important things you learned about her that might serve you well? 2. Go find out about the Victorian coast (or any other region, city, town, state, province or nation). How long is it? How many people live there? What is its climate? What are the biggest challenges or threats facing the coast? Rank the ten biggest from highest to lowest import and explain why you rank them thus. What should be done about these challenges? 3. What are the chief points of interest in a city like Los Angeles? Which museums, parks, entertainment facilities and points of interest listed by the encyclopedia for Los Angeles would actually be interesting and worth a visit? Which could you safely recommend to various people you know with different tastes and interests if you were planning a week long tour? Which are unworthy of a visit? 4. What are the main sections in Mozart's Piano Concerto? When does this concerto begin to approach greatness? How does Mozart achieve these great moments musically? To what extent is it Mozart as composer as opposed to the pianist and performer's rendition that impress or move us? To what extent a blend? This type of questioning unlocks an enigma, solves a mystery or completes a puzzle. While the process may commence with speculation, hypothesizing and supposing, the goal is to move toward understandings that are anchored in facts and reality. 4. How does Social Security work? How are we going to fund Social Security? This questioning illuminates the key differences between several choices or will supply the basis for a judgment for a particular course of action. 1. Go find out what people have tried to do in order to prevent wars. Which approaches to preventing war have had the most success over the years? Why do you suppose this is so? Which have the best prospects for the current century? 2. Go find out about Robert Frost, Emily Dickinson and Adrienne Rich. Which of these poets wrote the most illuminating and evocative works? What traits made their works superior? Which poets and poems may survive this century? 3. What do the candidates propose doing about Iraq? Which candidate has the most credible and logical approach to bringing peace, stability and democracy to Iraq? 4. What is the national budget for education, defense and health? How would you shift our spending priorities? Why? This questioning supports construction or adaptation to meet special conditions or requirements. 1. Go find out about acid rain (or some other major challenge facing the nation). Imagine the governor of your state has asked your team to come up with a plan to reduce the damage being done by acid rain to state forests. After reviewing what has been done in the past, what would be the main thrust of your proposal to restore healthy forests and moderate the impacts of acid rain? How can you improve on past efforts? 2. What did General X do in the Battle of Some Big River? Taking advantage of 20-20 hindsight, what do you think General X should have done differently during the Battle of Some Big River to reduce casualties and block the enemy from winning the war? 3. What is your synopsis of the novel Dirt Music by Tim Winton? Where did the story bog down, falter and disappoint you? What could Winton have done differently, do you suppose, to improve upon those sections? 4. What can we expect from falling objects in terms of velocity and momentum? How could you build a package to reduce the chances of an egg breaking upon impact after tumbling from the basket of a hot air balloon at 125 feet above the ground? This questioning identifies the prime arguments on behalf of a proposal of some kind. 1. What did Marie Curie discover? If you wanted to nominate Curie as the most influential scientist of her time, how would you support your case? 2. What are the main treatment choices for depression? After exploring the treatment choices for your friend's depression, you grow concerned that he/she is being unduly swayed by a charming doctor who is urging a path that might do great damage. What evidence, logic and testimony can you offer that might help him/her achieve a more balanced and healthy perspective? 3. What are the campaign planks of the major parties? Which party is most likely to address the major challenges of this town, city, state, province or nation in the most productive and constructive manner? What makes you think so? Why should I listen to you? 4. Which Australian novelists have achieved the most success with a global audience? Which two or three Australian novelists should have achieved the most success with a global audience? Why them and not the others? Which ones have actually won the most acclaim? Does this seem fair? Why or why not? This questioning seeks out the chief weaknesses in an idea, an argument, a research project or a plan. 1. What were the events leading up to the beginning of World War Two? What were the chief weaknesses in the foreign policies of France, Britain and the United States vis a vis Germany and Japan prior to World War Two? How could you have improved the policies? 2. What is the current space program for the USA? Are we on the right track when it comes to funding NASA and the current space exploration program, or should we be making major changes or considering some of the ideas advanced by President Bush? 3. How was intelligence gathered and assessed prior to the recent attack on Iraq? Do we need to modify the gathering and assessment of intelligence? If so, in what ways? 4. What happened to investments and pensions when the Dot Com bubble burst? Why are people so easily seduced by speculative bubbles and what can we do to reduce their power to entrance and harm investors? How can we avoid endangering pensions in the future? This questioning breeds familiarity and appreciation. 1. What stories has Annie Prouix written? How have Annie Prouix's stories changed since she moved to Wyoming? Was this a good change? Where do you hope she might move next? 2. What does Sydney have to offer? What are Sydney's chief charms? Which restaurants live up to or exceed their press? Which neighborhoods have the most soul? the most energy? the most quiet? the most crime and poverty? 3. Find out about Osama Bin Laden. What are Bin Laden's chief weaknesses, his major vulnerabilities, his obsessions and the patterns most likely to lead to his downfall and capture? 4. Who are the candidates? What has this candidate done about the major issues of the day? Has he or she served me well? What are the chances he/she will serve me well in the future? This questioning dispatches that which is unworthy of consideration. 1. Go find out about Jack London, the author. To what extent was Jack London a fraud? How did his public image, his fiction, his theories about the good life and his actual life conflict? Why did he die young? 2. What is our policy on jobs? What is going wrong on the job front? 3. How does science explain the power of diseases like SARS to spread and kill? To what extent is the power of SARS to spread and kill beyond the scope of science to explain? 4. What were George Bernard Shaw's main criticisms of his society? When was Shaw off base and lacking in judgment? This type of questioning explores doubts or boundaries while entertaining unusual possibilities and marvels. 1. How did our nation's European explorers treat indigenous people they encountered? What could we have done differently and how would that have changed the society that we are now? 2. What are we doing about Alzheimer's Disease? What is the best we could do about Alzheimer's Disease? Are we caught up or blinded in some ways to potential solutions? Why does Alzheimer's Disease seem to be on the increase? Are we paying the price for some terrible environmental faux pas or for chemicals in our diet? 3. What is meant by "checks and balances?" When have "checks and balances" failed to operate? How and why might such systems break down? How can we avoid disappointments? 4. What is the life of the artist? of the engineer? of the teacher? of the politician? Could I find joy and well being as an artist? as an engineer? as a teacher? as a politician? How could I protect myself from the risks and make the most of such a life? This questioning hypothesizes about likely outcomes. 1. What are the cultural preferences of those living in nations such as Iran, Iraq, Syria and Saudi Arabia? How does culture influence the development of democratic norms? What would it take to create a healthy and stable democratic government in nations such as Iran, Iraq, Syria and Saudi Arabia? 2. What went wrong during the Great Depression? Could something like the Great Depression ever happen again? 3. Which scientific laws or principles have proven to be unreliable or inadequate as we have extended and deepened the range of scientific understandings? Which scientific laws currently held to be true are most likely to shift during the next decade? Which are least truth worthy? If we can't trust science, then how do we know what to do? 4. What were the excesses of the previous decade? When folks look back at these times in a decade, which excesses will they list? Arming the young with the skills to wrestle with the tough questions and conundrums of life should be a prime focus of schools and teachers. The Great Question Press gives students the practice they need to make sense of a confusing world and find meaning when nonsense is the main song playing on the radio. Why should teachers nurture potent questioning skills and behaviors? As a practical matter, students need to be able to read between the lines, infer meaning, draw conclusions from disparate clues and avoid the traps of presumptive intelligence, bias and predisposition. They need these thinking skills to score well on increasingly tough school tests, but more importantly, they need these skills to score well on the increasingly baffling tests of life . . . how to vote? how to work? how to love? how to honor? how to respect? how to invent? how to understand? how to grow? how to adapt? how to sing? how to birth? how to pass it on? This approach contributes to high dropout and attrition rates - early school departures and millions of children left behind. Ultimately, a nation without citizens who question, wonder and challenge is a nation of sheep. We must show students how to "Go Figure" - work through the dilemmas, conundrums, paradoxes and challenges of life with skill, perseverance and integrity, to wrestle with what Michael Leunig calls "the difficult truth."